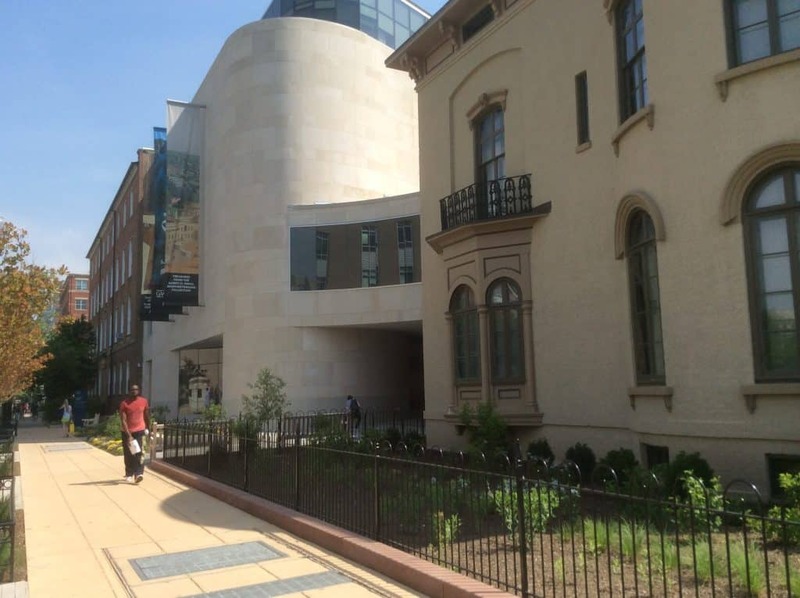 Located just five blocks from the White House, George Washington University is the quintessential urban campus. The Foggy Bottom Metro station at 23rd and I Streets is immediately adjacent to the medical school and hospital, and just a two-block walk from either the Marvin Center (in which the Student Center, food court, Admissions Office and bookstore are located) and the Gelman Library. The entire campus is compact – just 5 by 6 blocks – with both modern buildings and charming old rowhomes housing academic departments and dorms. GW’s Mt. Vernon Campus is a few miles away, with shuttles running constantly. Students can live at this campus, which has a much more suburban feel, as well as taking classes there – the same classes with the same professors are smaller, as the largest lecture hall on the Mt. Vernon site only holds 40 students. All outdoor athletic activities and sports fields are on this campus. Spirit for sports teams revolves around basketball – students love their Colonials and get free tickets to all athletic events. GW prides itself on the worldliness of its students; living in Washington, DC helps engage student in their disciplines in a different way. Students self-select a college when they apply; GW has 6 undergraduate colleges (a complete list of undergraduate majors is here). A majority of students enter the Columbian School of Arts & Sciences; most students take courses through this school as GW’s flexible core curriculum requires all students to take at least one math, one science and some writing courses regardless of their major. The Elliott School of Public Service is particularly well-regarded and is basically across the street from the State Department, giving students easy access to internship opportunities. 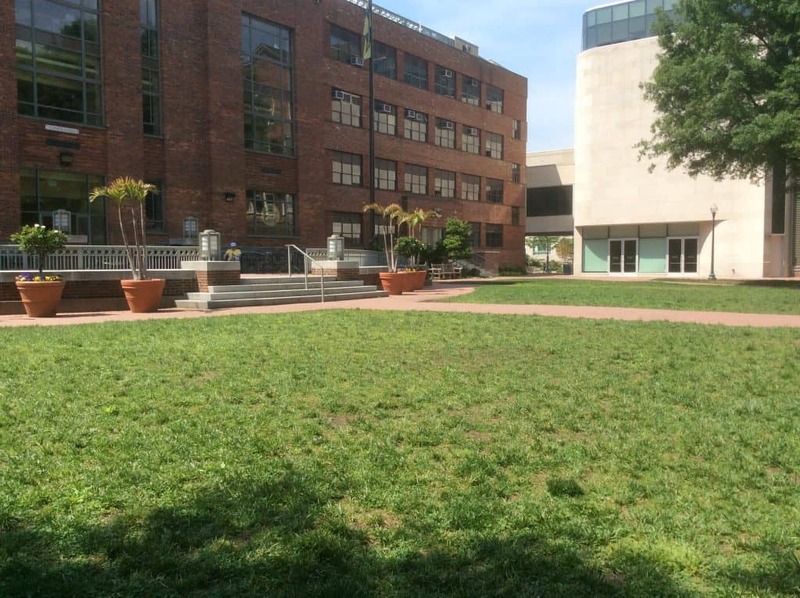 GW’s main campus does have green space – University Park offers students a quad-like grassy area to study and meet. While GWU has a strong reputation as a good place for students interested in politics (disclosure: Evelyn earned her Master’s Degree at GW’s Graduate School of Political Management), the school’s focus on experiential learning applies to students in all majors. Volunteer/service work is prominent here; it’s very easy to get involved in some type of service work in the nation’s capital. Study abroad is highly encouraged; 60% of all students and even 33% of engineers study abroad. GW has its own programs in Paris, Buenos Aires, Santiago, Madrid and London, and agreements with programs in dozens of other locations. GW has a highly competitive seven-year BA/MD program; 900 high school seniors apply for this accelerated medical school program and about 10 are admitted each year. Admitted students are TOP top super-smart students who complete a bachelor’s degree plus medical school a year faster than they otherwise would. Over 92% of students complete at least one internship before they graduate. A majority has two or three and many have more than that. Many students do internships that are totally unrelated to politics; there is a high concentration of nonprofits in DC, as well as research opportunities in medicine, space and science. “People here are passionate and looking to actualize that passion,” said my tour guide, Bridget, a sophomore, and she gave very specific examples of friends who have internships directly related to their interests. 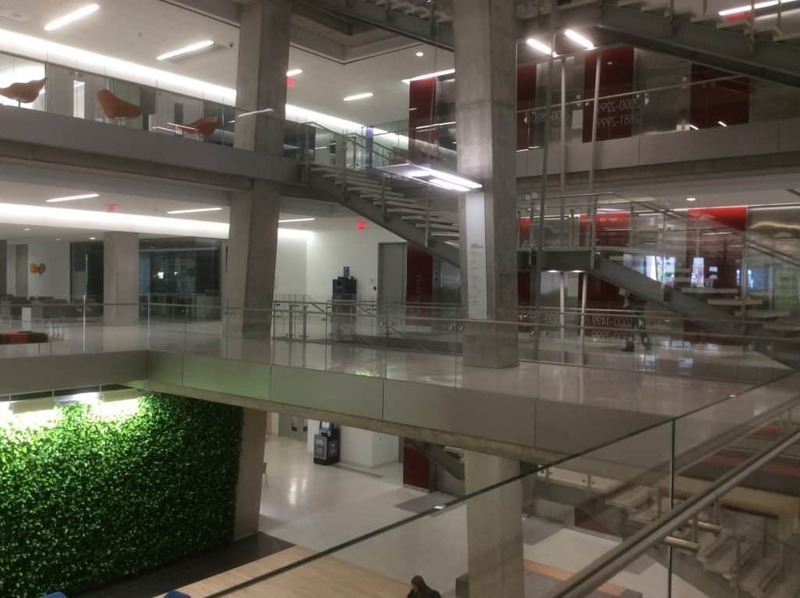 The atrium of the new science and engineering building includes a live bio-wall. GW’s campus lends itself to students who are active, involved and interested in exploring this city beyond the campus. It’s easy to jump on the Metro and be in a different part of town in minutes. The Capitol Mall is just a few blocks away – you can walk to the Smithsonian museums or take the Metro. The food court in the Marvin Center is the only dining on campus, but student ID cards can be loaded like a debit card, so that students can eat at local restaurants near campus. Dorms are more suite-style than traditional; students learn early how to budget, shop and cook so they don’t run the balance on their cards down too quickly. With a great urban feel, GW is a great place for students who are attracted to NYU, Boston University, Drexel and other city-based schools. Admissions stats: Mid 50% SAT CR 600-690; M 600-700; Wr 610-700. Evelyn visited in May, 2015. You can see all of her photos here.